OnDeck Coaching Tools are included with the SwimOffice Pro package. If you do not see the Coaching Tools menu, please contact info@teamunify.com to inquire about upgrading. If your team is brand new to using Coaching Tools there are a few tasks you need to do on your TeamUnify website to get your team set up and running—set roster group colors, designate coaches, and build custom tags and swim attributes. Return here when finished. 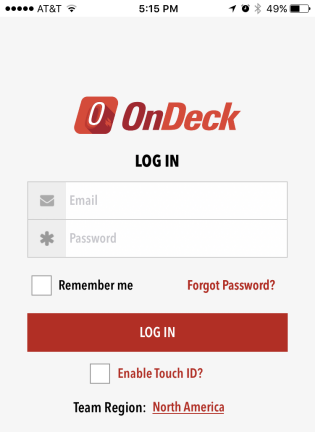 Tap the OnDeck app on your mobile device to launch it. If you live in a Team Region other than North America, tap North America, select your correct region, and tap Done. Enter your email and password (the same ones used to login to your TU website), then tap LOG IN. Tap Forgot Password? if you forgot it. Enter your login email and tap SEND and follow the instructions. If you belong to multiple TU teams, tap Select Team, tap your desired team, tap Done, then tap SEND again and follow the instructions. Once you have reset it, back in OnDeck tap Return to Login and try again. If you tap Enable Touch ID? on an iOS device, after your initial login with your password you will be able to use Touch ID instead on subsequent logins. 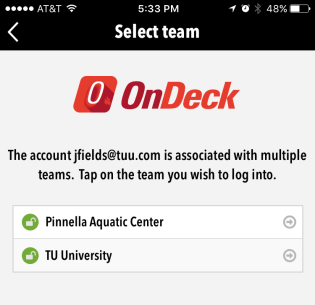 If you belong to multiple TU teams, it will give you a list of teams you belong to; tap the one you want to access. Those with an unlocked green lock use the same password; those with a locked grey lock require a different password. Once logged in, you can tap Switch Team to pick a different team at any time. If you are not familiar with all the navigation and other controls, we encourage you to learn about navigation controls in OnDeck, and then return here to continue. Now with all the basics out of the way, we'll show you how to schedule your practices.